The segue from the 1920s into the 1930s saw not only increases in the number of stations and their respective broadcast strengths, but programming changes as well. In the 1920s the newly forming airwaves had been dominated by local news and talk. By the early 1930s, North Carolina stations carried a wider variety of programs and the medium truly began to affect communities in significant ways. The proliferation of the technology and its increased cultural importance led the prewar era to be dubbed the first "Golden Age of Radio Broadcasting." In the difficult years of the Great Depression, President Franklin D. Roosevelt's "Fireside Chats"-nationwide evening radio addresses-harnessed the airwaves to promote a sense of national unity, although many southerners deeply resented his and his wife Eleanor's views on civil rights. Using special programming, live broadcasts, and raffles in which radios were the prize, numerous churches and organizations also launched successful fund-raising drives. And many politicians, such as Charlotte reform mayor Ben E. Douglas (1935-41) and Governor Clyde Hoey (1937-41), used the improved signals for political campaigning. Radio's real significance for the majority of southerners, however, came from the entertainment it offered, especially improved coverage of sporting events and musical programs. Better technology permitted easy access to live broadcasts of college football, Joe Louis's boxing matches, and baseball's World Series. Jefferson Standard Broadcasting Company, a subsidiary of Jefferson-Pilot, used its resources to pioneer spot news, entertainment, and sports programming on its stations, among them Greensboro's WBIG and the newly overhauled WBT. 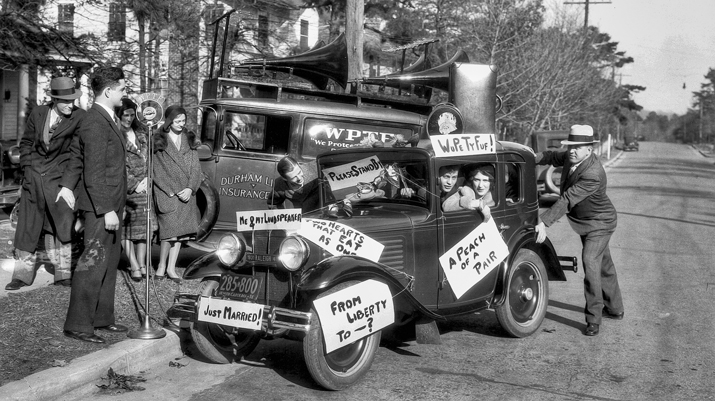 WPTF presented some radio "firsts" for the Piedmont, including coverage of football games, basketball games, political events, and the state fair. Radio also played an essential part in the increased popularity of many musical performers and genres in North Carolina. WSJS in Winston-Salem specialized in hillbilly and church music, a growing trend with the advent of technology needed to provide live musical broadcasts. In 1939 seminal bluegrass musician and Shelby native Earl Scruggs, then only 15 years old, first played on North Carolina radio. A year later Kay Kyser, a Rocky Mount native who earlier had achieved national success with his big band variety show Kay Kyser's Kollege of Musical Knowledge, made $1 million with his nationally syndicated program that reached an estimated 20 million listeners. Legendary banjo player Bill Monroe also delivered numerous live performances from WBT in the late 1930s and early 1940s, as did fellow bluegrass favorites Lester Flatt and Charlie Poole. For enthusiasts of classical music, WPTF also provided broadcasts of the Metropolitan Opera from New York City on selected nights. In 1931 Raleigh radio station WPTF broadcast the marriage of Felton Williams and Peggy Fussell. Courtesy of North Carolina Office of Archives and History, Raleigh. Call no. N_53_16_2512. Bill Monroe played the mandolin.